In sorting, species determination and counting of selected taxa from the North Sea and the Baltic Sea, MariLim once more proved its high expertise. In 2018, the Quality Assurance Authority of the German Marine Monitoring Programme for the North and Baltic Seas (BLMP) at the Federal Environment Agency (UBA) organized the 7th Macrozoobenthos Ring Test. Now, the final report is published. The ring test was conducted between the end of August and the middle of October 2018 with 14 institutions processing 16 sample sets. From the North Sea, 12 small glasses with 21 pre-defined taxa had to be sorted out and determined. The Baltic Sea was represented by a Kautex bottle filled with sediment containing 11 taxa (156 individuals). This samples had to be rinsed and sorted, before the individuals found could be determined. The aim of the ring test was to evaluate the performance, i.e. the sorting and counting accuracy as well as the taxonomic expertise of the participating institutions. Members of the MariLim laboratory staff, Galyna Cherednichenko, Sandra Dittmer and David Johannes, processed these samples using 18 hours (generally the time frame is 10–20 hours). They determined the North Sea taxa with 98 % and the Baltic Sea taxa with 100 % accuracy; only one North Sea species was not correctly identified. Regarding the Baltic Sea taxa, an overall assessment of the quantitative and qualitative performance was calculated by combining accuracy rates. MariLim belongs to the top 4 of all participants. Our laboratory team correctly determined all taxa. The counted numbers of individuals were within the pre-defined tolerance range. Together with Angel Borja (AZTI – Tecnalia, Spain) and Heliana Teixeira (university of Aveiro, Portugal), MariLim is doing a training course on 8.–9. Mai 2018 in the application of the assessment software NEAT. In the course, the background of the assessment method will be explained, the use of the software demonstrated, and the attendants will have the possibility to perform environmental assessments using their own data with the help of the lecturers. More information about the course is located on the course website. We have completely revised our website and transformed it into a contemporary layout. The new pages automatically adapt to the screen of the used device, be it a desktop computer, a tablet or a smartphone. We hope that all content is easily accessible and visually appealing, and we welcome feedback. Since its foundation the MariLim Aquatic Research GmbH pays attention to provide high quality standards when it comes to project realization as well as working conditions for its staff. In the end of 2016 we startet to further professionalize our management systems, and in July 2017 TÜV NORD CERT certified that MariLim GmbH applies management systems in line with the following standards. Preparation of biological expert reports on environmental impact assessments, intervention assessment, baseline investigations, appropriate assessments according to the habitats directive, reports on species protection and water law as well as research, environmental monitoring and conuslting in marine and limnic fields. The website Waters Assesment has been published. The website is an information platform for the assessment of surface waters according to the European Water Framework Directive. For rivers, lakes, transitional and coastal waters you can find all information regarding the assessment, e.g. the method description for the assessment of the guiding quality components. The content presented on the website represents the current version of the German Oberflächengewässerverordnung [meaning directive on surface waters], which in Germany implements the European Water Framework Directive. All the texts published are formatted in PDF style for your personal download. You can also find the primary literature, which is the basis for the information given on the website, as far as it is permitted by copyright regulations. Red lists are an important tool in nature conservation and form one instrument for spatial planning and decision-making processes relevant for the environment. Red lists provide a list of all existing but specifically of all extinct, lost and threatened species, communities or biotopes. 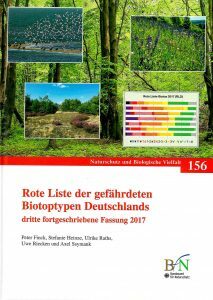 Whereas red lists for species have a comparatively long tradition in nature conservation, the first edition for red listed biotope types was published in Germany at first in 1994 by the Federal Agency of Nature Conservation (BfN) and a second one in 2006. The latest (third) edition was published in Mai 2017 and includes also a complete revision of the marine biotope classification system. The classification was compiled by MariLim GmbH in cooperation with BioConsult Schuchardt & Scholle GbR and IOW Warnemünde as well as numerous biotope experts of the BfN and various regional agencies. The new classification is an adjustment to international standards like HELCOM HUB System. Germany’s red list of biotopes and biotope complexes. The second edition of the DEVOTES book “Bridging the Gap Between Policy and Science in Assessing the Health Status of Marine Ecosystems, 2nd Edition” has been compiled and is now available online. The book contains 37 chapters in total, with the most important findings from the DEVOTES project and you can download it for free. Marine management requires approaches which bring together the best research from the natural and social sciences. It requires stakeholders to be well-informed by science and to work across administrative and geographical boundaries, a feature especially important in the inter-connected marine environment. Marine management must ensure that the natural structure and functioning of ecosystems is maintained to provide ecosystem services. Once those marine ecosystem services have been created, they deliver societal goods as long as society inputs its skills, time, money and energy to gather those benefits. However, if societal goods and benefits are to be limitless, society requires appropriate administrative, legal and management mechanisms to ensure that the use of such benefits do not impact on environmental quality, but instead support its sustainable use. NEAT is an acronym for „Nested Environmental status Assessment Tool” and the software is an implementation of NEAT as a biodiversity assessment tool used for assessing the environmental status of marine areas according to the European Marine Strategy Framework Directive (MSFD). NEAT itself as an assessment method is not restricted to the MSFD but can be used for various other assessment needs and is usable for any MSFD descriptor. The NEAT software aims to represent a flexible and user-friendly desktop application. It integrates results from several work packages of the DEVOTES project in order to be a central access point to the data collected in the project and to make use of these data for the biodiversity assessment. NEAT is available as free download for Mac and Windows on the official DEVOTES website. The DEVOTES software Tool to select indicators for the Marine Framework Strategy Directive (MFSD). DEVOTES aims at supporting the implementation of the MSFD in European waters by improving the understanding of human activities and variations due to climate change on marine biodiversity. This includes testing the indicators proposed by the EC and the member states and develop new indicators for assessment at species, habitat and ecosystem level, in order to assess the environmental status of the marine environment. To support this process, a catalogue of indicators has been produced as an inventory of existing methods. It forms the basis for gap and quality analysis, for refining existing and developing new indicators. The original contributions to the indicator catalogue, collected from the DEVOTES partners, were put into a database. To make this information available in an userfriendly and applied way, the DEVOTES software application DE­VOTool was written by Torsten Berg, a team member of MariLim on the basis of some already existing application. The software and the metadata content will be continuously maintained and enhanced. DEVOTool is available as free download for Mac and Windows on the official DEVOTES website.